For Brownies, preheat oven to 350°. Line 13 x 9-inch baking pan with aluminum foil; grease and flour foil and set aside. Melt Country Crock® Spread and chocolate in large saucepan over low heat, stirring occasionally. Remove from heat. Stir in sugar, then eggs, one at a time, and vanilla. Stir in flour and salt until blended. Spread into prepared pan. Bake 25 minutes or until toothpick inserted in center comes out clean. Cool completely on wire rack. Lift brownies from pan and cut into 16 squares. For Caramel Sauce, bring brown sugar, Spread and cream just to a boil in medium saucepan over high heat, stirring frequently. Cook 10 minutes or until thickened. Stir in vinegar. 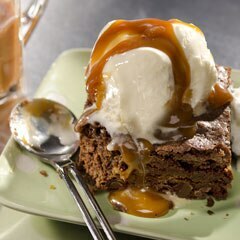 To serve, top brownies, (warmed if desired) with a scoop of Breyers® Ice Cream, then drizzle with Caramel Sauce and, if desired, top with whipped cream.